The high-profile Vietnamese diss ident and writer known as Mother Mushroom has arrived in the US with her children and mother after being released from jail. 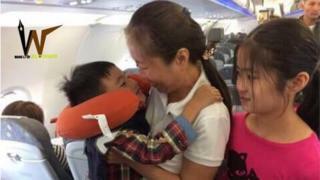 Nguyen Ngoc Nhu Quynh left Vietnam on Wednesday to fly to Houston, Texas, immediately after her early morning release. In 2017, she was sentenced to 10 years in jail for distributing propaganda against the state. Vietnam's one-party communist regime frequently jails its critics. Arriving at Houston airport, she told a crowd of supporters she would "never keep silent" in her fight for democracy in Vietnam. News that Ms Quynh had been released on Wednesday emerged soon after US Defense Secretary Jim Mattis left Vietnam after a short visit. It is unclear if he pressed for her release and the Pentagon is yet to comment. Rights groups welcomed the activist's release but warned that freedom of speech in the country remained severely limited. "This good news, which comes as a relief after two years behind bars, should also be a reminder of Vietnam's worsening record of jailing anyone who criticises the regime," Nicholas Bequelin of Amnesty International said in a statement. "While Mother Mushroom is no longer imprisoned, the condition for her release was exile and there are over one hundred people languishing in jail because they peacefully spoke thei r mind - in public, on blogs or on Facebook." The activist started a blog in 2006 raising awareness of social injustice and pointing out political and environmental concerns. Her unusual moniker is based on the nickname "mushroom" for her youngest daughter. She also co-founded the Network of Vietnamese Bloggers, an independent writers' association. With the growing importance of social media, the internet has become a vital platform for dissidents in a country which tightly controls its media. In 2015, Mother Mushroom received an award from the Sweden-based Civil Rights Defenders and in 2017 was awarded the International Women of Courage Award by the US state department. Turkish officials say it shows the Saudi journalist was killed inside the Saudi consulate in Istanbul. Can a cooker help save the rainforest?